Canberra’s new Oktoberfest event is all set to get the dancing and beer-drinking going at Patrick White Lawns on the shores of Lake Burley Griffin on Saturday, October 14. 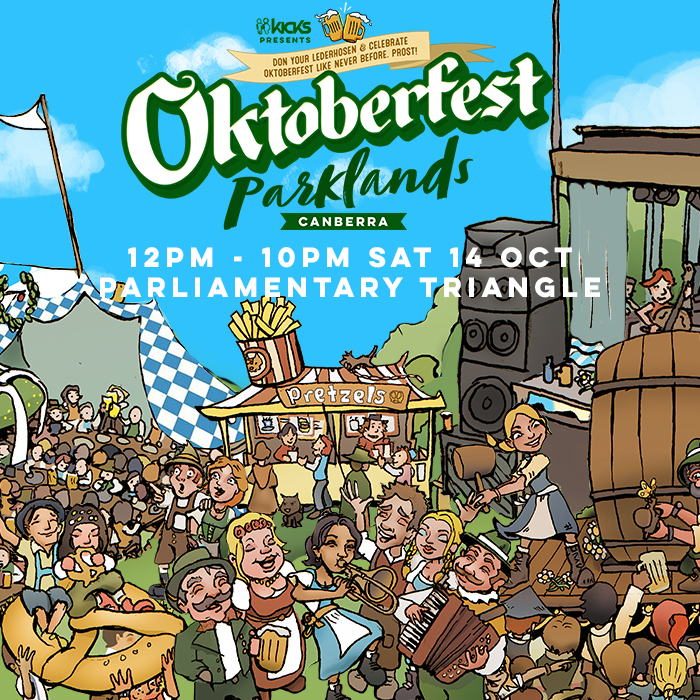 “Oktoberfest Parklands will transform Patrick White Lawns into a massive lakeside Volksfest celebration with Craft Beer Halls, Bavarian Food Truck Village, Oompah bands, DJs, traditional dancers, side show alley, rides and amusements and a whole host of other entertainment for you und dein Freunden!” enthuse the Kicks Entertainment team. You have to be over 18 to attend the event, which runs from midday to 10 pm on October 14. Tickets are on sale through Moshtix (click here) and provide you with entry to the event, wunderbar entertainment, a commemorative Oktoberfest Parklands Beer Stein and your first drink. The organisers advise that this is an event where you should definitely dress up. Women are advised to go with the classic colourful Bavarian Dirndl dress complete with matching apron – or alternatively to don a female Lederhosen. Men are advised to go with a Lederhosen, Platterhosen, or a plaid shirt. Important accessories include a felted hat and suspenders. If one Oktoberfest event is not enough then the good news is that there’s two on this year! The Harmonie German Club has been holding Oktoberfest festivals for Canberrans since 1962 and will be running their annual event at The Queanbeyan Showgrounds this year from Friday, October 27 to Sunday, October 29. Organisers of Oktoberfest Canberra say they needed to move locations because the fees to use their former home at Exhibition Park had increased dramatically. The Harmonie German Club says that this year’s Bavarian festival will be their biggest and most entertainment-packed weekend ever. “We still have all the amazing German foods, fully-imported crafted beers and wine, traditional music, German dancers and bell-ringers but we have added in a beer garden, new shows, exciting competitions, Sunday Family Day and markets, free amusement rides and more,” say the organisers.